The Jolicloud Jolibook. Oh yes, it's sounded like a made-up device ever since the pictures of it started to leak out, but the netbook centered around the Jolicloud Linux operating system is indeed a real product. So real that we've been using the Atom N550-powered system over the past few days. Sure, we've gotten looks in public because its cartoon-covered lid, but the £279 ($443) machine isn't meant for "grown-ups" -- it's intended for a younger set, or those between the ages of 15 and 25. You know, those that tend to live in the Cloud. 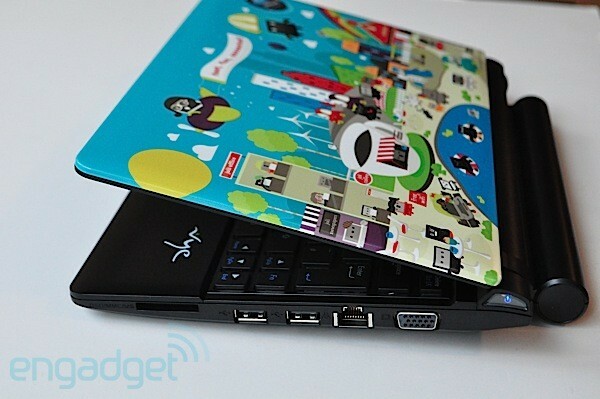 So, does the netbook have appeal beyond the young'uns? And is the social, app-based Jolicloud 1.1 OS, which is built on Ubuntu and HTML 5, robust enough to take you away from Windows or another flavor of Linux? We've got the answers to those questions and so much more in our full review. Be the first to review the Jolibook? Whether or not you like the Jolibook's lid obviously comes down to personal preference -- some we showed it to couldn't get enough of it, while others said they wouldn't be caught dead with it. Personally, we think it looks a bit childish, though we're continuously intrigued by the what's going on in the motif -- what are a bunch of netbook computers doing hanging in some sort of town with a Joli Office and Joli Coffee!? Is this what life is like on the Jolicloud? Is there a Joli Juice where they can recharge? Never before has a laptop lid made our mind churn so much with questions. 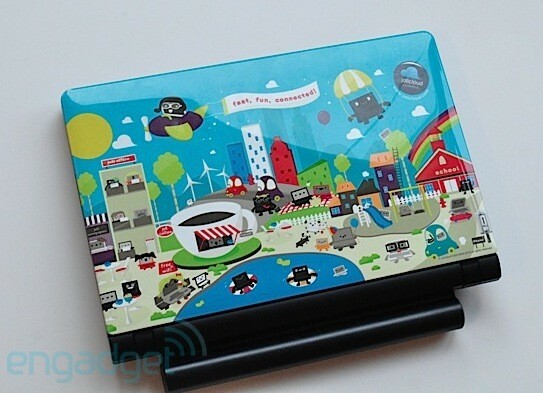 If you can look past the trippy lid, you'll find the Jolibook to be your average 10.1-inch netbook. Built by Vye, an ODM in the UK, the inch-thick chassis is made of black plastic and is surrounded by three USB jacks, VGA and Ethernet ports, and headphone and microphone sockets. There's also an eight-in-one card slot on the right edge. It's actually not a bad feeling little laptop, though obviously there are more svelte looking systems out there -- we're looking at you, ASUS Eee PC 1018P. And let's be honest, you can't stop starring at that big bulging six-cell battery up there. We have to say it gives the netbook a very dated look, and also adds quite a bit to the three-pound weight of the device. Also, the battery itself is a bit wobbly -- even when locked in, it jiggles a bit. 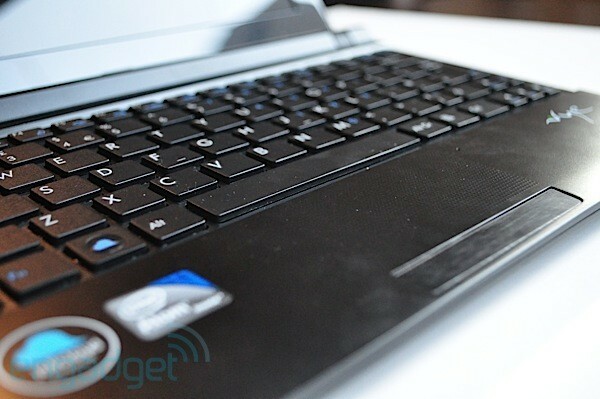 The chiclet keyboard on the Jolibook is reminiscent of those on ASUS' netbooks, and that's not a bad thing. The raised, plastic keys are well spaced, and while the layout is still a bit cramped, we were able to type the majority of this review with very few typos. As the Vye Jolibook is only being sold in the UK and other parts of Europe right now the keyboard layout was a bit foreign to us Americans, but when you first boot the system you are able to pick the software layout. Still, the right and left Shift keys are shrunken, and yes, it's extremely frustrating. The touchpad also seems to steal its look and feel from ASUS' playbook (no, not RIM's tablet) -- the pad is flush with the palm rest and is only differentiated by small braille-like dots. The small bumps aren't as pronounced as the ones on ASUS' pads or even Lenovo's ThinkPads, but it is still mighty comfortable on the index finger. That said, we did run into some navigating issues -- for the most part it allowed us to point and click just fine, but other times it just didn't want to cooperate and the cursor just kept jumping all over the screen. We're inclined to blame the close proximity of the pad to the keyboard, but we didn't have the patience to deal with it so we whipped out our Logitech Anywhere MX mouse. The Jolibook also packs Bluetooth, so a regular Bluetooth mouse will fit the bill as well. The 10.1-inch, 1024 x 600-resolution display is bright enough for watching videos on YouTube or Hulu, but the quality of the panel leaves more to be desired. The screen is just fine for watching the latest SNL clip with a friend, however vertical viewing angles aren't stellar and setting it back a bit requires you to adjust the screen forward quite a bit. We grabbed the Cheese webcam program from the app store, and had a ball snapping pictures of our mug using the 1.3-megapixel webcam. 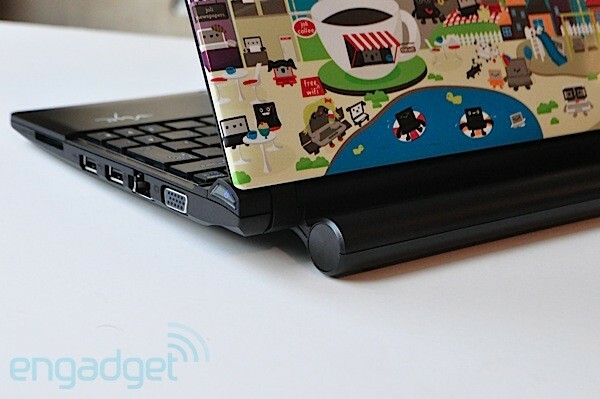 The speakers are standard for a netbook -- they're not loud and relatively tinny. Ah, the operating system. The Jolicloud! The major differentiator between the Jolibook and the other Windows 7 Starter netbooks out there. Yep, it's the center of the experience here, and those that have used Jolicloud 1.0 or 1.1 before will be right at home, but if you're new to the Ubuntu-based, web app-centric operating system there's quite a bit to explore. In essence, the OS is the antithesis of Windows or a "desktop" based OS -- all the applications you need live on the first tab of the main menu, what the company calls its Dashboard or "App Launcher." As you can see above, it looks a lot like iOS in the sense that its a grid of applications and you can add as many pages of apps as your heart desires. (The netbook comes with most of the apps you'll want right off the bat pre-installed, including Gmail, Chromium, Twitter, OpenOffice, Skype, etc. You can install more from the app store, but we will get to that soon.) When you launch a web app or program, it lives on the top of the screen and you can toggle between them up there or by hitting Alt + Tab. Pressing the Jolicloud button on the keyboard always lets you return to the main menu. The second tab on the main menu is what the company calls its "Social Stream," and it's really the feature that differentiates the OS from any of the other custom netbook Linux builds (i.e. 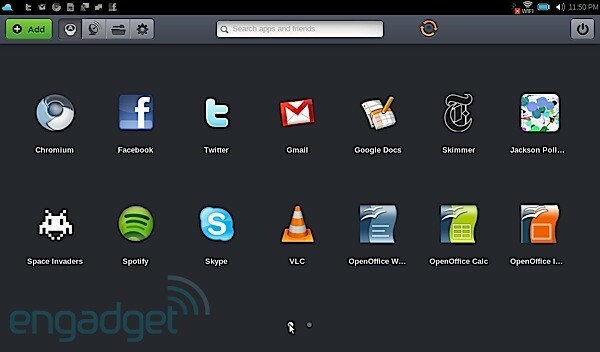 Ubuntu Netbook Remix, Meego, Easy Peasy, etc.) out there. When you first get the netbook or use Jolicloud on any other computer, you're required to sign up for an account using your e-mail address. You are also able to log in using your Facebook username, but that's only after you've had a Jolicloud account setup. The reasoning behind all this is two-fold. Firstly, it lets Jolicloud store information about "your Jolicloud" -- what apps you have, your settings, etc. -- on its servers so you can log into the OS on any computer. They don't call it the "Anywhere OS" for nothing! Secondly, it lets you connect with friends that also may be Joliclouders. Once you "follow" or friend those individuals, the Social Stream pulls in information about them -- what apps they like or they've downloaded, etc. You can follow them and they can follow you back. You see, it's a social OS -- not just an OS built around social networks. The third tab is where you can view your files and folders as well as access Cloud storage services like Box.net and Dropbox. The fourth contains information about your Jolibook as well as you account. In reality, you will spend a majority of your time on the netbook in the various web apps, which are for the most part just websites that launch as separate apps rather than just as another tab in the Chromium browser. There isn't a way to create your own web app or shortcut based on a website (no Engadget app for you! ), but there are over 700 free apps in the store, which include popular sites like YouTube, Gmail, Facebook, Twitter, Hulu, etc. and loads of others. The entire experience is familiar since it's really just a browser based OS, but there are also non-web based apps like VLC Player, 280 Slides, OpenOffice, GIMP, and Boxee. Luckily, that means that if you aren't near a WiFi hotspot, the netbook isn't just a brick -- you can still write documents, take pictures or watch some local video. (Sadly, we've been hearing Chrome OS won't have that same sort of offline functionality.) Overall, it's a very user friendly operating system and extremely simple to master. Those that have been scared of the big, bad scary Linux, have nothing to worry about here, however, those that wish to experiment with Sudo command this and that can always get behind the scenes by hitting Alt + F1 to access the terminal. Because Jolicloud was built for underpowered systems (and actually for resurrecting older / slower laptops), the operating system sails on the netbook's 1.66GHz dual-core Atom N550 processor and 1GB of RAM. Not only does it take about 20 seconds to boot, but the Chrome-based web apps are just quick to respond. There was absolutely no lag when we wrote this review in OpenOffice while simultaneously listening to music in the Pandora app and checking e-mail through Gmail. As we've seen with other N550 netbooks, the processor is fine for playing 720p local content and full screen Flash video, but 1080p video still plays like a slideshow. Jolicloud went with a 5,400rpm, 250GB hard drive instead of a smaller, faster solid state drive, which is nice for storing more local files, but it's a bit odd since chances are most of your files will live in the Cloud here. So, does that bulging 48Wh six-cell battery provide some serious cord-free runtime? Uh, not really. On our video rundown test, which loops the same standard definition video at 65 percent brightness, the Jolibook ran for four hours and 46 minutes. That's not terrible, but not as long as other dual-core notebooks out there like the HP Mini 5103 which runs for over six hours or even the ASUS 1015PN with NVIDIA's Ion. We expected better especially with that large cell strapped to its back. We should also note that the right side of the system did get noticeably warm after a few minutes of use. And ultimately, that's what it comes down to -- if you're looking for a netbook that's all about Jolicloud, the Jolibook and its crazy lid will fit the bill, but if you're not all about one Linux OS, giving up Windows, or having a cartoon all over your netbook you're best just scooping up one of our preferred netbooks like the Toshiba Mini NB305 or HP Mini 5103, downloading Jolicloud 1.1, and making a Jolibook of your own.